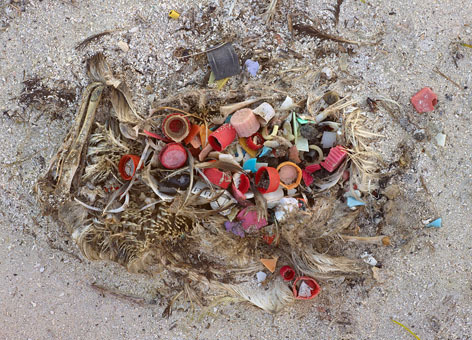 The remains of dead baby albatrosses reveal the far-reaches of plastic pollution on Midway Atoll, 2000 miles from any mainland. Credit: Chris Jordan, from his series "Midway: Message from the Gyre." Used under Creative Commons Attribution-Noncommercial-No Derivative Works 3.0 United States License. Garbage patches aren’t a solid patch. The name conjures images of a floating landfill in the middle of the ocean, with miles of bobbing plastic bottles and rogue yogurt cups. While it's true that these areas have a higher concentration of plastic than other parts of the ocean, much of the debris found in these areas are small bits of plastic, or microplastics, smaller than 5mm in size that are suspended throughout the water column. The debris is more like flecks of pepper floating throughout a bowl of soup, rather than a skim of fat that accumulates or sits on the surface. Microplastics are nearly ubiquitous today in the marine environment and may come from larger pieces of plastic that have broken down over time, from fleece jackets or plastic microbeads added to face scrubs. The impacts of these microplastics on marine life is an area of active research. 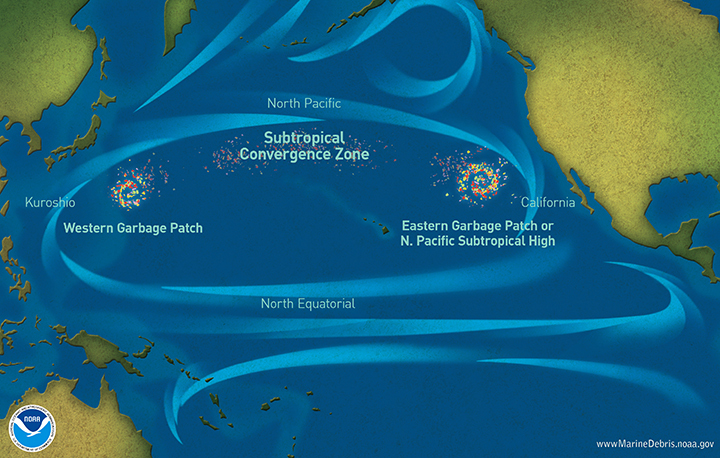 There are many garbage patches, and by that, we mean that trash congregates to various degrees in numerous parts of the Pacific and the rest of the ocean. These natural gathering points appear where rotating currents, winds, and other ocean features converge to accumulate marine debris, as well as plankton, seaweed, and other sea life. Any way you look at these "peppery soups" of plastic in the Pacific, none of the debris should be there. The NOAA Marine Debris website and blog have lots of great information and references if you want to learn more about the garbage patch issue. Looking for more information about the garbage patches?